We had been wanting a smoker for awhile, but were not willing to spend the equivalent of two months rent on a Traeger. Fortunately for us, Popular Mechanics came out with plans to build your own for between $50-$100 dollars. Much better! The plans are straightforward and funny, which makes the process more fun. We highly recommend this smoker, as it has led to countless delicious hunks of smoked meat. Finding a barrel was easy for us. We found a beekeeper in a little town about thirty minutes away who used food-grade barrels to store honey in and was selling the now-empty barrels for $15 each. We made the drive and bought our sticky drum. 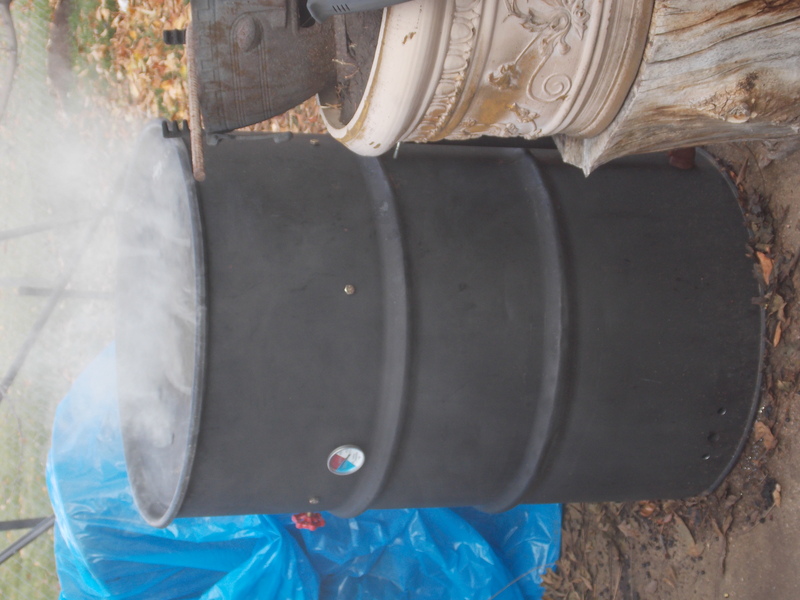 We used water and a brush to wash out the honey and then spray painted the outside with heat-resistant black paint. All of the other parts were easy to find at Home Depot. We realized a step bit is really nice for drilling the holes, and comes in handy for all sorts of other things, so if you don’t have one, make the investment. If all else fails, they are really cheap at Harbor Freight. We also decided after our first attempt at smoking that we needed way more ventilation, so we ended up drilling way more holes than the PM guy did so we could get to the temperatures we wanted. Once we had the holes drilled, the air intake valves were easy to install and they work well with the faucets we bought. We initially tried to save money by using a small Webber picnic grill as the fire basket, but quickly realized we would never get enough air flow that way, so we bought the expanded metal after all. Save yourself the trouble and just follow the plans in the first place. Add a thermometer and you’re ready for smoking! Our favorite go-to easy smoker items are pork roasts and bratwurst. Smoked pork is always delicious, and smoked brats get the most amazing thick crust that holds in tons of juicy flavor. We’ll post our rub recipe and general smoking tips in another post. We love this smoker. It’s an inexpensive way to cook really delicious meat in your backyard. Fair warning, you, your house, and your cat will smell like smoke and meat for days. How do you smoke your meat? Favorite recipes?